The consummate reality of the Deerfoot concept is ideally realised by the flawless execution of Condor, built by Kelly Archer Boatbuilders Ltd, Auckland, New Zealand. 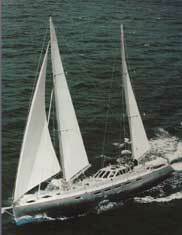 This is truly a yacht of infinite safety and comfort, manageable by two people for fast day sails or 10,000 mile voyages. 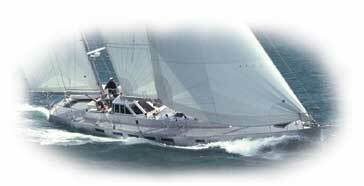 A true purest sailor's yacht, all systems are reliable and easily maintained and serviced. The exterior requires virtually no maintenance as the aluminium structure uniformly oxidizes creating a no maintenance finish. The well proven philosophy is that allowed to oxidize, bare aluminium creates its own finish that eliminates the need for maintenance, other than to rinse off the salt as the need arises. Redundant systems abound and 4,000 pound / 1,814 kg ballast tanks add to the speed and comfort offshore by leveling out the angle of the heel to easily achieve 300+ mile day runs. Condor's interior stands up favorably to the world's finest mega yachts, yet maintains the principle of the Deerfoot concept. Accommodation sleeps six in three separate cabins. The master cabin is forward with an ensuite shower/bath combination. The two guest cabins aft, both have ensuites with a shared shower.